Helping a friend, and giving you a chance at immortality. Your Name in a Novel! Be Famous! Have your name (or the name of a loved one, pet, etc) included in my next novel! Can be a character, a named place (manor/restaurant/pub), a book title/author, et cetera. Any sort of name you wish. Name and some description. Three available. Tertiary character, who will have some dialog & interaction with other characters. One available. Top bidder in each category will be able to purchase as many of the item that they wish from those that are available, at the winning bid price. After that, the second highest bidder may purchase as many as he/she wishes from those that remain, at his/her bid price, etc. There are a number of additional great items up for auction on the site (including a signed & numbered hand-bound, hardcover copy of Communion of Dreams with a reserve bid of just $25), so I’d invite you to check it out. The auction will commence this coming Friday, and go for two weeks. Full details on the auction site*. So if you can, help me help a friend … and make yourself immortal, at least in my thanks. *There’s also a GoFundMe page if you just want to make a donation. Thank you. Astronomers have a mystery on their hands. Two large radio telescopes, on opposite sides of the planet, have detected very brief, very powerful bursts of radio waves. Right now, astronomers have no idea what’s causing these bursts or where they’re coming from. And nothing has been ruled out at the moment — not even the kind of outrageous claims you’d expect to see in tabloid headlines. As you would imagine, there’s been lots of speculation about what’s behind these mysterious bursts. Some astronomers think they’re caused by blitzars, pulses of energy from a supermassive star collapsing into a black hole. Others think they may be caused by power solar flares coming from stars nearer by. The man sitting next to him got up, stepped up to the holo of the artifact still rotating there in the center. Robert Gish was a little unkempt, his beard untrimmed, his dark hair matted. He was out of shape, almost flabby in appearance. His scientific reputation was as unconventional as his looks. More so. He had been responsible for the radical change in long-range sensing which led to the development of the Advanced Survey Array. Nobel Prize stuff. A true genius, not just brilliant but able and willing to make leaps that took others years to understand. Which was why Bradsen had him here: Gish had been saying for decades that there was other intelligent life among the stars. Saying it so loud and so often that he was considered a crank, since he had no proof and couldn’t even really explain why he believed it to be so, at least in a way that others could accept. Just think — all the folks who are prepping to deal with some global emergency almost got a chance to see how well their theories work in practice. My friends who are into Steampunk and the SCA would have reigned supreme! Back in 2012, the Sun erupted with a powerful solar storm that just missed the Earth but was big enough to “knock modern civilization back to the 18th century,” NASA said. The extreme space weather that tore through Earth’s orbit on July 23, 2012, was the most powerful in 150 years, according to a statement posted on the US space agency website Wednesday. “If the eruption had occurred only one week earlier, Earth would have been in the line of fire,” said Daniel Baker, professor of atmospheric and space physics at the University of Colorado. Ah well. Better luck next time! Psst … hey, wanna buy some bookbinding tools? Yeah, that’s a bookbinding tool, not the kind designed for decapitations. With it, you can easily slice through a stack of paper about 6″ thick. I have one very much like it. 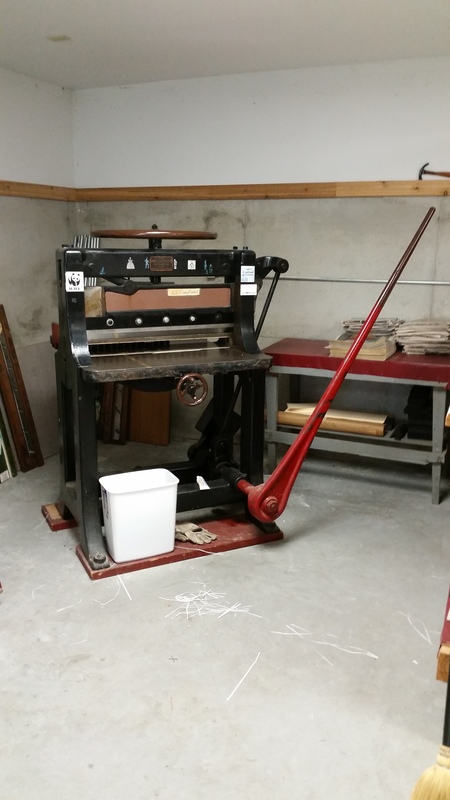 OK, so here’s the deal: another bookbinder I know is retiring. And she wants to find a good home for all her tools and equipment. Including that beauty above, a number of book presses of various sizes, hot foil stamping machines (and type) and a *bunch* of handtools. It’d be sort of like how I got some of my tools from another bookbinder who was retiring. If you’d like to see more of the tools and equipment, go over to Facebook. Yes, I know that it’s evil, etc. But it won’t kill you to use it for this very specific purpose. Check out these two album sets on her Facebook Page: One, Two. And while I haven’t seen all the prices she is asking for the different items, the ones I have seen are *very* reasonable. You can contact her directly on Facebook, or if you need an email address, just contact me. This equipment is fairly rare. And if you’ve ever had a desire to learn the craft of bookbinding, this is a great opportunity. And you can pee upside down, which I did, just for fun. Wouldn’t you? Great little list about the reality of spaceflight at this point in time. Perfect perspective for this weekend, since he manages to capture and convey the wonder and excitement so many of us felt from the Apollo era. It’s so easy to lose your vision, your enthusiasm, in the grim plodding of day-to-day life. Thanks to all who helped make the recent anniversary promotion of Her Final Year a success! Worldwide there were about 150 downloads – not a huge number, but it is progress. I hope the book can help those who downloaded it. Progress continues on St Cybi’s Well. Hope to wrap up Chapter 9 in the next couple of days.